Description: Dress up in skintight leather and sleek racing stripes. Look great while you race your new sport bike all summer long! Instructions: Use your mouse to click on and through the floating clothing, hair, accessory, and background options for this slim motorcycle chick. Become the magazine super model of your dreams. 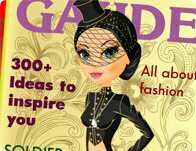 Take to the cover and smile for the world as you set the trends and make fads fabulous.